Wetherby’s External Wall Insulation has been successfully installed at a former metal works site in Birmingham to complete the new Tauheedul Eden Boy’s school. The new 700-pupil Eden Birmingham Secondary school in Perry Barr is complete with sports hall and play area on the landmark site on Wellhead Lane; opposite the old Birmingham City University Campus. ADP Architects and Thomas Vale Construction were awarded the project for the Tauheedul Education Trust. 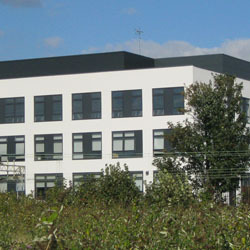 Wetherby’s Mineral Wool insulation was specified for this new build project as it is the ideal solution for education applications due to its excellent acoustic performance combined with its non-combustible inorganic rock wool core meaning noise can be minimised throughout and strict fire regulations can be met. A mineral wool quilt using a thickness of 150mm was initially installed within the steel framed structure (SFS) studs followed by cement particle board (CPB) and then a further layer of mineral wool insulation at a thickness of 120mm. By completing the build-up of layers in this formation it has enhanced the thermal performance allowing us to achieve an impressive u-value of 0.15 w/m²K. To complete the system, the building was finished with Wetherby’s silicone 1.5mm ‘K’ render in white allowing the external finish to be in keeping with the three adjacent Grade II listed gatehouse buildings.